The history of Chi Chapter of Theta Chi begins on Tuesday November 17th, 1914. It was on this day that the precursor to Chi Chapter, Alpha Sigma Colony, was started by five men: Paul E. Engle, John R. Boyle, Clyde A. Donehoo, Robert S. Dennis and Noble C. Powell. In the original minute books of the fraternity the founders state the purpose as: “Feeling the need of a fraternity having as its ideal the highest and truest standard of brotherhood, the organizers and founders of Alpha Sigma Fraternity have endeavored to make this aim the fundamental principle of the organic life”. The first pledge (called postulant by the Alpha Sigmas) was Lapton A. Wilkinson. He pledged a week after the founding and was initiated two days after his pledging. While the minutes discussing the switch from Alpha Sigma to Theta Chi have been lost there are some facts that can be assumed. One is that during the four years ΑΣ had been in existence three different local fraternities had shut down, so it can be assumed the founders wanted the stability of a national organization. Secondly, it is possible that brothers, in fact, knew about Theta Chi Fraternity and tried to set up their fraternity in its likeness. Direct proof of this comes from the very ritual of ΑΣ which states: “Strive at all times to aid your fellow men in every honorable and upright way. Never permit to pass, without making us of it, the opportunity to lend a helping hand to a brother who needs it”. The helping hand is also the central principle of Theta Chi Fraternity. On Tuesday, April 20, 1918, Alpha Sigma Colony was chartered as Chi Chapter of Theta Chi Fraternity at the Alabama Polytechnic Institute. In 1960, the school officially acquired the name that it had long been called - Auburn University. The first man to be initiated as a Theta Chi at Auburn University was William Wallace Allen (born December 5th, 1896), who would later become the first president of Chi Chapter. Allen was actually a brother ofΑΣ, he pledged on November 8th, 1915 and was initiated a few days later. Chi Chapter has had four houses while at Auburn University. The first house was Dorm 12; the second house was located near downtown Auburn by the Freewheeler Bicycle Shop. Our third house, built in 1952, was located at 712 West Magnolia Avenue. Currently, we are living at 935 Lem Morrison Drive. The house was completed in the summer of 2007 and is a state-of-the-art fraternity house. 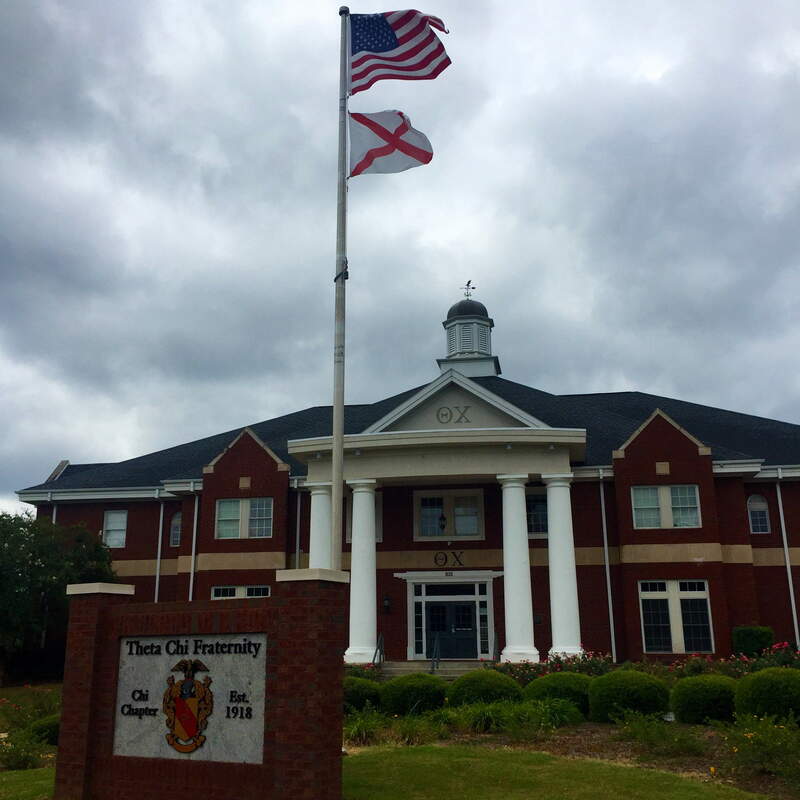 Chi Chapter is the 22nd oldest chapter of Theta Chi Fraternity and the 11th oldest fraternity at Auburn University.